Never really noticed this place was open. With all the time that I was going in and out the Uptown Punch Pizza, I never paid attention to this bakery next door. They opened after the Thanksgiving weekend, so it wasn't really that long ago. And honestly, I didn't even know what that spot was before. Between Punch Pizza and Barns & Noble, I never learned there was a spot for another shop. Very simple and minimal decor. I don't know why but this gives me the Seattle type of feel. Probably because of the wooden interior, the dreadlock guy and probably because it was rainy and gloomy today. Home made bread, labor intensive process and no shortcuts. I like that idea. Bread are made daily, with special bread made on specific schedules. Store favorite is the Rustic bread: free form loaf with chewy crust and light crumb. Very doughy. I also tried the Miche bread: traditional dark country dough, thicker crust, great with cheese. Perfect texture. Not too soft, not too crumbly. Lemon confit with poppy seed, with a thin coat of sugar. Haven't had one of those honest good old scones for a while. Those you got at some major chain bakeries or coffee shops just couldn't do it. Don't know if it's because of the shelf life or because of the recipes. But I know I like this one. And nothing pairs better than a fresh cup of coffee. Freshly grounded beans with the Clover machine brewing process. The Clover machine uses a brewing method similar to that of a French press along with a vacuum system to separate the liquid from the coffee grounds. Guatemalan Antigua brew, has a clarity flavor to it. Beans aren't over-roasted, and the Clover machine definitely makes a difference. It was probably one of the richest coffee I have ever had. And somehow, this Clover machine company is bought out by Starbucks. 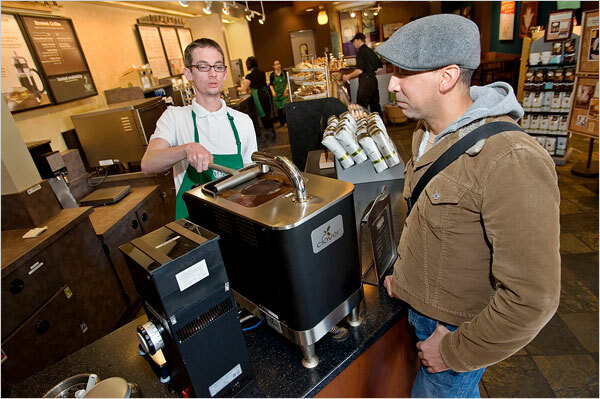 But not many Starbucks get to feature this Clover brewing machine. Only a few in the SF/Bay Area, a few in the headquarter Seattle, and a few in the Boston area. Yet, Rustica got to feature this in their store in Minneapolis. Now that's something special. I should do a little taste test with the Clover machine vs Fresh pressed vs Drip. And Rustica offers all that. Isn't it great? We should have more coffee shops like this. You know where to find me on the weekends now. I'm not leaving Rustica until somebody finds me another good coffee shop! How's the bread. We can't find any good breadshops here in Minneapolis. Worth trying their bread. I like the Rustic and the Olive! You can also ask for a sample at the store. your blog is amazing. Can you take me with you on your next food adventure?! the rustica on 46th street is almost an everyday visit when we are visiting Mpls. their pain au chocolat, baguette and fabulous fruit and nut bread are our favorites.